Yes, my friends, the 80s are back! 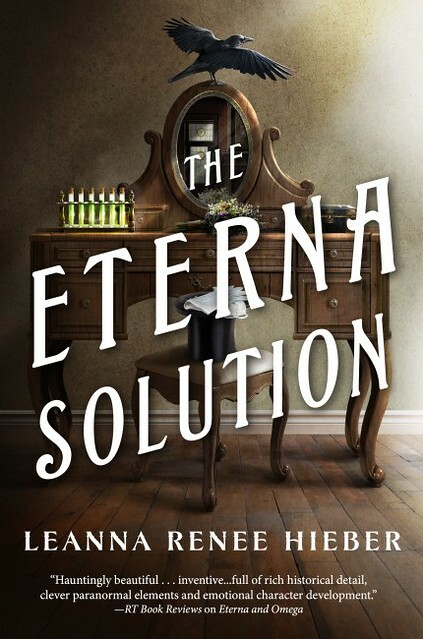 No, not the 1980s: The 1880s, where author Leanna Renee Hieber has spent much of her creative life, culminating in her new novel The Eterna Solution, the third book in her Eterna Files series. And what has Hieber been doing, back there in the 1880s? Just you wait. The big idea behind The Eterna Files series came from my desire to fashion two 1880s X-Files-esque and MI-5 kind of departments chock full of interpersonal drama and lively characters. And then set them against a huge, paranormal evil. Phantasmagorical fireworks ensue. This is my third Gaslamp Fantasy series and one of two connected series with Tor Books, a house that has been actively reissuing my award-winning and bestselling- but previously out of print- Strangely Beautiful saga. The Eterna world embraces the importance of personal magic and the resilience of the human spirit. Beloved Gothic traditions are all present but reimagined; Ghosts! Adventure! Mystery and Drama! But for all my Sturm und Drang, I wanted to craft small, practical, meaningful moments of magic. When imbued with personal spirit and private meaning, tiny gestures have a huge protective quality. The quest for understanding, for meaning, for purpose and calling drives all of my characters. That’s what makes their embrace of personal, localized magic very powerful. This is a saga of Wards. My Eterna Files trilogy culminates this week in the brand new The Eterna Solution. The series features a huge cast of quirky, inclusive characters from London and New York, in an 1882 timeline very much like our own, but in which paranormal aspects dominate the lives of a select few. The first book (The Eterna Files) is a parallel narrative following two teams in New York and London that entwine by the second book (Eterna and Omega). Spiritualists, policemen, circus performers and secretaries join forces as the Eterna Commission in New York and the Omega Department in London, both created to focus on pursuing immortality, become allies when they realize they’ve been pitted against one another by a vile, secret cabal dealing in foul, malevolent magic. I started my first novel when I was a pre-teen and it was set in 1888. I’ve been writing about this decade for most of my life. It’s not just a penchant, it’s a calling that drives me on a level that defies even my own understanding. Perhaps I’m like one of the many Spiritualist mediums in my work; channeling an age that whispers its hopes and dreams to me and wants me to tell its stories, all of which feel deeply, inexplicably personal. Clara Templeton, one of the series stars, was one of the hardest characters I’ve ever written, because she’s the closest to me and there’s a danger there. I had to separate her out from me like untangling a knot of woven hair in order to have any kind of objectivity. The heart and soul of her remains deeply intimate. Alternately, her foil, my stoic London detective Harold Spire is a fierce skeptic and almost a curmudgeon, and yet such an effective teammate despite polar differences. I grew to love him all the more for his opposite nature. As a New Yorker of over 12 years, and having spent months across many years researching in London, the power of a place is the core of my personal, Ward-driven magic. As a New York City tour guide for Boroughs of the Dead, Manhattan’s highest rated ghost tour company; I tell the stories of New York ghosts as friends of mine, haunts I visit every week. They’re the immortal story my characters seek, and the stages of New York and London are such rich characters in and of themselves. My characters are unapologetically themselves and seek to be treated with respect and full rights in a society that was extremely limiting, restrictive and compartmentalized. They find allies and community, found families and fellow travelers. Contrary to the rare reader who thinks I, as a modern writer, force feminism, orientation and/or racial equality on my characters in some sort of anachronistic take, my characters’ attitudes reflect actual historic evidence and tracts that date back far earlier than my 1882 setting. The punk in Steampunk is only earned by questioning power dynamics and institutions, and I’m in the related/parallel genre as a Gaslamp Fantasy novelist. (To make the genre delineation clear: Steampunk is Steam-powered-era Science Fiction in which characters solve problems with SciFi tropes and innovative technology, Gaslamp Fantasy is gas-lit-era Fantasy where characters solve problems with Fantasy tropes and spectral, magical conventions). My characters question their world, chafe against strictures, and seek to be reformers just as many movements did. Since I’m working in a covert branch environment, paranormal aspects carve out space for all my characters to have as much agency and self-determination as they all deserve and the secret departments allow for workings around societal restrictions. The era itself is rife with conflict, which is always great for storytelling, and as the 19th century was rather obsessed with ghosts, séances, pseudo-sciences and occult goings on, my Eterna world is a phantasmagorical reality not far from our own, and I dearly hope you’ll come along for the action, fancy outfits, adventure, tidbits of actual history, and plenty of murder and mayhem. Cheers and Happy Haunting! When shall we three meet again, indeed!? On a ship in the Atlantic, and more than three. This is intriguing, both description and excerpt. And ‘Boroughs of the Dead’? I didn’t know Manhattan had ghost tours! I really enjoyed Ms. Hieber’s participation in the panels at the Vermont Steampunk Expo earlier this month. I learned so much and can’t wait to start this series.